This is where the format shift comes in. An active studier would take information they are studying and re-organize it. For example, they would take the content from a textbook paragraph and create a schematic diagram, pictorial diagram, or a compare/contrast table. The key to the format shift is the process. The act of transforming the information from one format to another embeds the information much more deeply. The multiple formats are more compelling than a plain paragraph in a textbook, so this also makes studying more interesting! The next time you have to study for a test, consider the format shift in order to get the most out of your study session. The following guest post is by Dr. Penny Cuninggim, Founder and Associate Director at New England Adolescent Research Institute (NEARI) and Director of the Brain-based Learning and Resource Center. You can sign up for NEARI’s “Smoothies for the Brain” Newsletter here. Imagine your child in a world where something as basic and reliable as the sound of the school bell or another person’s touch is perceived as something foreign or threatening. Imagine that when others climb and happily slip down the slide, your child cringes, feeling dizzy at the top of the ladder, and has to back down the rungs in shame. Or imagine that when other children are eagerly examining a dead frog your child is crumpling to the floor woozy from the smell. If this describes your child, then learning is not a fresh and rewarding experience. Instead, it is fraught with landmines of all kinds. If one’s senses aren’t working properly, learning is no fun, and school is no longer a safe and secure place to be. Many students with behavioral and learning problems in school are unable to focus because of sounds, smells, sights, tastes, or tactile sensations that take away their attention and increase negative emotions. In addition to the traditional five senses, a student might also have trouble sensing where his or her head and body are in space (the vestibular sense), or where and how various joints and muscles of the body are operating (the joint/muscle sense). These seven “senses” need to be working together in an integrated way in order for students to learn easily. These dysfunctional behaviors are the result of a student’s inability to modulate, discriminate and organize sensations to adapt to classroom demands. In effect, these children cannot integrate incoming sensory information to complete learning tasks successfully. One student might be distracted from his math work by noises on the playground outside the classroom window, the teacher’s perfume, or the clock ticking at the front of the room. Another student might get stuck on a written assignment because of the intermittent giggling between two girls seated behind him or the collar of his new shirt scratching his neck. And still another student might be unable to either answer a question the teacher asks because she is uncomfortable standing to recite or role-play an appropriate social interaction with another student. For most students, sensory issues can be accommodated by teachers as part of a classroom learning process. In a few cases, students may also benefit from additional work with an occupational therapist. The goal of using special sensory supports in the classroom is to a relaxed alert state in the student. 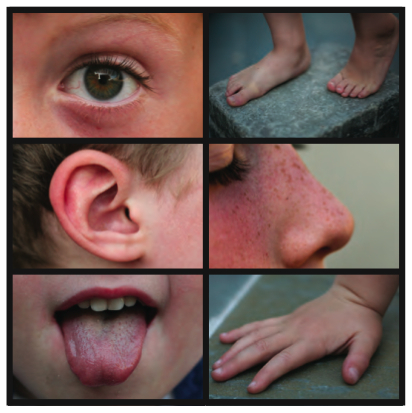 Teachers and parents can use many teaching strategies and sensory tools to help children compensate for their sensory dysfunction. These teaching techniques and tools may feel like luxuries in a high stakes testing environment. Nothing could be further from the truth. For these students, time on learning is critically enhanced through the use of specific sensory techniques that address their individual issues. It is a win-win strategy. Last spring, administrators at Indian Creek School, an All Kinds of Minds School of Distinction, searched for a book for summer reading for the faculty that would be meaningful and relevant to teachers across all three divisions of the school, from pre-kindergarten to 12th grade. Why Schools for All Kinds of Minds? Administrators chose Schools for All Kinds of Minds because they believed it would serve as a platform for the faculty to review, reflect upon, and discuss Indian Creek’s ongoing commitment to using the All Kinds of Minds approach to teaching and learning. Group discussions would also provide the opportunity to learn how teachers in each division are using the All Kinds of Minds philosophy and framework in their instructional practice. All faculty members were given a copy of the book on the last day of school and asked to prepare for small group discussions to be held at the start of the school year. How are teachers nurturing and using students’ strengths and affinities to support learners and learning? How has the teacher’s role changed with the All Kinds of Minds approach? How do we help students develop metacognition and insight into how they learn best? The facilitators agreed that the goal of the discussions would be to determine how reading the book would affect our teaching and our students’ learning this school year. Over 80 faculty members gathered in small groups on the first day of school. A major “aha” for many was the book’s shift away from a focus on students’ weaknesses and the emphasis on using students’ strengths and affinities to support and leverage learning. Teachers perceived this to be an important change in perspective which would allow a broader implementation of the All Kinds of Minds framework and would ultimately improve the learning experience of all students. “To build a mind requires that you understand it” was an idea that resonated for many teachers. Teachers also felt that the book validated the importance of investing time and effort into understanding the unique minds in our classrooms. During discussions, it became obvious that while the details of how teachers achieved this goal differed according to the grade level of the students, teachers shared a belief that getting to know students is the best way to support them. “To build a mind requires that you understand it” was an idea that resonated for many teachers. Discussing Schools for All Kinds of Minds reenergized our teachers, deepened their understanding, and renewed our commitment as an All Kinds of Minds School of Distinction. It provided a meeting ground in which elementary, middle, and upper school teachers could learn from each other and share insights and ideas. For us, it was the right book for building bridges across three divisions. What’s next at Indian Creek? The book discussion was so successful that another has been planned for mid year so teachers can share how they are implementing the ideas they took away from the book. We are focusing on “small-wins” – a concept highlighted throughout the book – and sharing our success stories regularly at faculty meetings. Administrators are also giving teachers an opportunity to visit classrooms across divisions to observe the implementation of All Kinds of Minds strategies and practices. Mary Mannix is the Lower School Learning Specialist and All Kinds of Minds Coordinator at Indian Creek School in Crownsville, Maryland. She is also a long-time All Kinds of Minds facilitator. Have any other schools out there engaged in a book study using Schools for All Kinds of Minds? If so, tell us about it! What were your faculty’s “aha’s”? How will you continue to use the book throughout the school year? Questions for Mary? Leave a comment … we’d love to hear from you! Note from All Kinds of Minds: Did you hear about our free book giveaway? We’ve already given away several books, and this is the last week of our giveaway! Here’s how it works: Each week that we feature a blog post related to Schools for All Kinds of Minds, we’ll be giving away a free, signed copy of the book! To be entered to win this week, you must (1) subscribe to our blog, and (2) share your thoughts about this blog entry by posting a comment. Remember: Non-subscribers are not eligible to win! Subscribing is easy: just look for the “Email Subscription” box to the right. We look forward to hearing from you! In our recently-published book, Schools for All Kinds of Minds: Boosting Student Success by Embracing Learning Variation, our CEO Mary-Dean Barringer makes the point that “Educators, school leaders and policymakers … talk around learning but not about learning,” and she notes that equipping educators with current knowledge from science about how we are wired to learn is essential to the future of education. But how can educators access this knowledge? And once they have, how can they translate what they’ve learned into practical solutions in their classrooms, schools, and districts? Providing answers to these questions is a big part of our work here at All Kinds of Minds. Reading Schools for All Kinds of Minds can be a great first step for educators seeking this expertise. This book gives school leaders insights, examples, and tools to help them use the All Kinds of Minds approach to transform their classrooms and schools and ultimately help their students learn and thrive. It highlights schools that have made real progress in building their learning expertise for the benefit of their students and shows educators how taking even small steps can help them meet their long-term goal of ensuring that all students find success. We invite you to join us on our blog over the next few weeks as the book authors share some ideas and tips from the book as well as personal insights around the book’s content. But that’s not all. Each week that we discuss an aspect of Schools for All Kinds of Minds, we’ll be giving away a free, signed copy of the book! To be eligible to win a book, you must subscribe to our blog and share your thoughts about the blog entry by posting a comment. Check back next week for the first Schools for All Kinds of Minds-inspired post. We look forward to sharing elements of the book with you! More than ever, America needs the kinds of minds that generate new perspectives, seek solutions, and discover emerging opportunities. Those are the minds of many of the students in your schools today who, at first glance, look a lot like the struggling student I was in school. I invite you to take a second look at the individuals who walk through your school doors. Join us in helping as many kids as possible become more aware of their unique talents and more confident in their learning abilities—and help us rescue the wonderful potential that may otherwise be lost. If you’ve already read the book, we’d love to hear what you found compelling, how it’s influenced your thinking, or how it’s changed your practice. Leave a comment below! By the time children and adolescents arrive at school, chances are that they’ve already interacted socially with a number of different people: their parents/caregivers, siblings, friends, school acquaintances, and bus driver, to name a few. And once they’re in school, they assume the role of student. As students, they also interact with teachers, administrators, and other support staff around the school. When interacting with all these different individuals, students need to consider the audience, or person with whom they are interacting, in order to communicate effectively and “fit in” socially. Students who are able to adjust their language in response to their current audience practice one of the most sophisticated aspects of social cognition: code switching. We don’t use the same language or speak in a similar manner with our parent(s) or caregiver(s) as we do with our friends; and we speak in a different voice when we are interacting with someone in authority (e.g., teacher, principal, or policemen). To effectively engage in code switching, students must devote attention to the understanding and use of language (i.e., code), as well as to the appropriate use of the language code of the particular audience. The ability to identify the audience and respond with the most appropriate code is a skill that we utilize throughout our lives. Guide students in identifying the conversational styles expected from different audiences (friends, teacher, parents, etc.). For example, have students complete a chart, writing down the language that they can and cannot use with different groups. Students may need to improve their ability to modify both the content and the delivery of their interactions – both what they say and how they say it. Use role-play situations to help students develop these skills and structured opportunities for them to practice with school personnel. Students may benefit from examining the consequences of failing to switch conversation codes. Activities where students can play with language might include role-play activities and writing plays or short stories. Students may need to develop an understanding of the language of their peer group to interact more effectively with their classmates. Setting up social skills training groups in your classroom may give students a chance to learn and field-test new skills and behaviors that contribute to social competence. In order to maximize the likelihood that newly acquired knowledge and skills will transfer to other settings, talk with students about the need to accept others as well as how to develop adaptive coping strategies for unsuccessful attempts at social interaction. We’d love to hear what strategies or activities you’ve used to help students who are struggling with code switching. Leave a comment below with your ideas! This is the last post in our blog series, Understanding Common Learning Challenges. But not to worry — we’ve got some great ideas for the upcoming months and we’ll be continuing to post new entries regularly!